Today’s companies find themselves in a sea of endless choices when it comes to marketing their company’s products and services. For years many companies have used traditional advertising methods such as print, radio, and television to get their message across. However, the Internet has changed everything. New marketing strategies have come along including search engine optimization, pay-per-click, and now social media websites like Facebook and Twitter ad a new and fascinating way to reach new customers. WeSprout can help you develop and implement a strategy which position your products and services in front of potential customer. We are a full-service marketing company able to help develop a library of marketing collateral including print, radio, television, internet ads, photography, video, search engine marketing, and much more. We are heavily focused on maximizing your return on investment for each and every marketing dollar you spend. 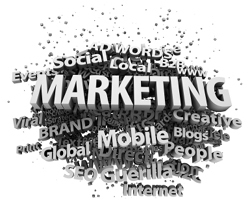 Now, more than ever, it is important to have your marketing efforts convert potential customers to actual customers. Best of all, many of the strategies we use are measurable which means you can readily measure the success of your marketing efforts.